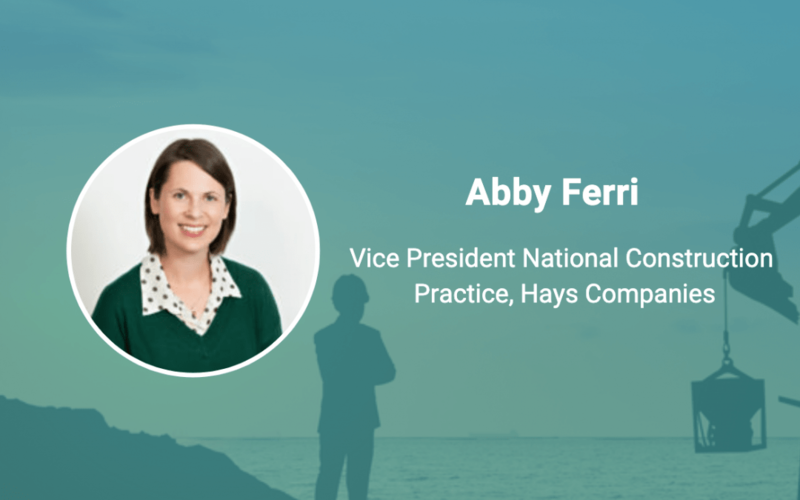 Abby Ferri, Vice President National Construction Practice, Hays Companies, has more than 16 years of experience in the field of safety and health, in diverse industries including construction, manufacturing, healthcare, hospitality, beverage, and retail. She’s been described as a “practical and creative safety professional,” and that phrase is fitting! Whether it’s someone who has just started in safety—or a top executive with years of experience, Abby has the ability to connect, engage, grow, and teach safety leaders, no matter where they are at. Her approach helps build best-in-class safety programs and improve their cultures. Keep reading to see the experience that’s helped shape her approach to safety and one of the companies she admires in terms of their culture of safety. It wasn’t an earth-shattering experience at the time, but I think of it often. In the first year of my career, I walked to an area of a jobsite where there was concrete shoring in place and observed a worker way higher than he should have been without fall protection of any kind. I got his attention and asked him to come down, he argued with me briefly and I was at a loss for what to say, being so inexperienced. I asked him if he’d let his son be up there in the same situation—with no fall protection. At that moment, his son, who I had not yet met, emerged from a shadow behind his dad and said, “I’m up here too!” It was at that moment that I realized clichés that many safety pros use in training are meaningless! Safety is personal, and often it is a tough road to find what motivates a worker to have a better safety mindset. I think it is that moment that made me realize I needed to be able to tell my own stories and always customize my approach to worker interactions and training. Is there a company that you admire in terms of their approach towards safety? In the past year, Clark Construction and Corvex Safety have made me optimistic for the future of construction safety and safety in general. Clark Construction identified the need for innovation and disruption in head protection. Traditional hard hats just don’t provide the protection a construction worker needs in varied fall scenarios. I was inspired by Seth Randall, a Division Safety Director at Clark Construction, when he presented the story of how the company implemented a safety helmet program at the AGC safety conference last summer. Their crews look different from most, but I believe safety needs innovation in how workers are protected. Corvex Safety is changing how workers observe the jobsite by establishing communities at the site level. I can’t wait to see what else they, and the rest of the market, do with the Internet of Things. What do you wish others knew about safety or supporting safety? It’s not rocket science! When I conduct training, I make sure to keep it simple. But remember, simple isn’t easy…I coach workers on what I consider the fundamentals of safety: identification of hazards and controls. The difficult part is implementation and that’s where a safety professional has to shine to influence stakeholders at their organization who make purchasing decisions, conduct planning and estimating activities, and who allocate the time for workers to receive training.